The Second Lead Syndrome is strong with this one. Ending on a simultaneously exciting and devastating scene, the build to this moment has been a roller coaster ride in terms of tension between characters and the plot itself. From the overnight trip and forgotten wallet to Sung-joon (finally) softening toward Hye-jin, it’s all culminated in this scene. While I should have recognized the foreshadowing of the car that needed repairs, I was still surprised with how it went down. Except the rain. It seems like because of Sung-joon’s associated trauma with rain, every emotional moment will use it — color me unsurprised by the cliche. Despite the cliched climax at which the last episode ended, I was pleasantly surprised by how it has all built up to this moment. The work trip they take works quite well and realistically to create a moment for them to bond. Sung-joon’s embarrassment at forgetting his wallet and the subsequent labor “payment” puts them at the same level for once, humbling him so that he actually begins to look at Hye-jin as an equal and colleague deserving of respect, rather than just as a lackey intern as he’s previously treated her. The fact that this moment is not lovey-dovey but rather friendly and even work-related, when she talks about ideas for the shoot on the beach, doesn’t make this seem forced to start a romance just because they’re the leading characters and will eventually end up together. This is more organic than I’d originally imagined, making this transition from his immense dislike and disrespect for Hye-jin to his eventual feelings for her more believable. Even the fact that he fires her later doesn’t seem out of place. He is clearly under a lot of pressure from the American branch of The Most, and Hye-jin is in fact the only one who is aware of it. So his sudden firing of her for such a crucial mistake as failing to guard the James Taylor collaboration dress, the piece central to their 20th anniversary issue, may seem unusually harsh to the rest of the staff but is actually understandable, even if it was too much. Sung-joon has a magnifying glass on him, and the slightest error could cost him everything. Since Hye-jin knows this, her forgiveness and even defense of him later is not farfetched for her just, hardworking nature. On that note, I am glad that Hye-jin’s expected makeover was of her own accord and none of this demeaning, chaebol-buys-poor-“ugly”-girl-expensive-clothes-and-make-up nonsense a la Boys over Flowers. Instead, Hye-jin decides to make the most (pun intended) of her return to The Most by actually doing her part to show her interest in fashion. She’s not pretending to be the bizarre, outrageous fashionista editor-in-chief La-la Kim (Hwang Seok-jeong) or the manipulative Han Seol (Shin Hye-seon) so it’s not a complete 180. In these past five episodes, no one has made unrealistic changes, which I definitely appreciate, as this is usually the part where people become more deeply entrenched in stereotypical roles. Even Ha-ri, who is made to appear as the antagonist, isn’t really any different. She hasn’t become evil suddenly or hidden a diabolic side all this time. Even though she’s lying to Hye-jin about her relationship with Sung-joon, she doesn’t enjoy it at all. Instead, we see her suffer with anxiety because of her inability to cope with keeping this secret from her best friend. Each of these characters is so human and real that altogether they make it easier to suspend disbelief, the key to reeling audiences in. I feel everyone’s pain, happiness, love and jealousy. The actors truly inhabit each role, fleshing them out completely with such detail. Park Seo-joon‘s clipped words while at work become stilted when around Hwang Jung-eum‘s Hye-jin. Hwang uses her wide eyes to naively appreciate Shin-hyuk’s kindness and overlook his feelings for her. 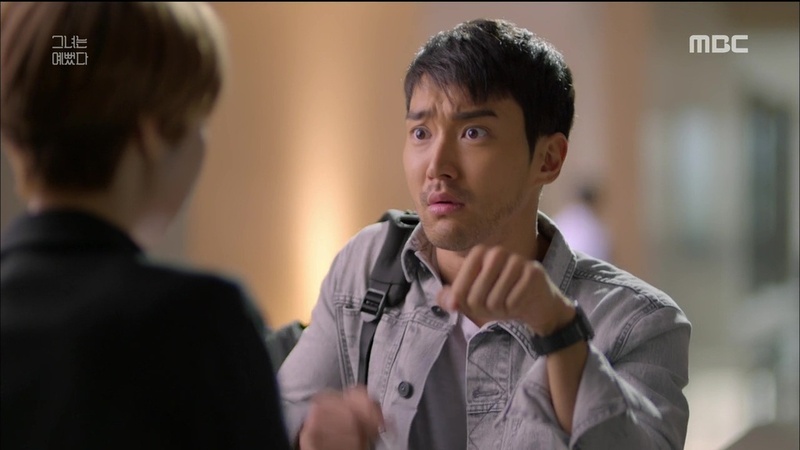 And Choi Siwon — oh, Siwon — with his kicked puppy dog sadness and inability to show it to Hye-jin because he likes her that much and doesn’t want her to see his hurt. On the bright side, Shin-hyuk’s growing closeness with Ha-ri is so cute. I just love that she thought he was a homeless guy and tried to get him removed from the suite floor. The basis of their relationship — the fact that he’s living in the hotel where she works — remains to be seen. He may be a client and so she feels the need to attend to him, but the question this raises is why is he living in a hotel in the first place? He’s embarrassed at how it will be viewed and so tells Ha-ri to keep it to herself so it doesn’t seem like the context to his living situation is anything he wants to be forthright with anyone about, making this all the more intriguing. We already have the rumor that someone at the magazine is the nephew of our slightly crazy editor-in-chief, who in turn is connected to the board that runs the entire business, but we still don’t know who that person is. With the mystery shrouding Shin-hyuk’s living situation, it is quite possible that it’s him. If you ask Han Seol though, she wouldn’t believe it. The beauty and fashion coordinator, power hungry and manipulative as she is despite her innocent appearance, is convinced that if she can find out who the nephew is and snag him for herself, that she’ll be set for life. After overhearing the editor-in-chief at the store mention her secret nephew, she has been sure that it is Kim Joon-woo (Park Yoo-hwan) since Shin-hyuk is crazy and dresses like a homeless guy, and Kim Poong-ho (Ahn Se-ha) is too gross and unfashionable. It doesn’t help that the editor-in-chief has made several direct comments to Joon-woo that Seol has taken confirmation. Of course, since this is a drama, Seol has to be wrong. Thus, the question remains to be answered. My bet is with Shin-hyuk. With every detail contributing to the tightly woven narrative, this cannot be the only unrelated subplot. It simply doesn’t make sense, especially not in dramaland where every little thing matters. Regardless of the end answer, I can’t deny that I laughed so hard at the entire detour Seol took to have Joon-woo all to herself for the work trip. Pretending to have the car break down and sitting next to him to eat lunch and imagining their little campfire were all great, but nothing beats the reality of that afternoon. While I feel bad about the fact that she got sick from her food, her determination to get Joon-woo despite feeling ill, despite leaving the bathroom smelling rank and despite falling down while running away is on a whole other level. After all that’s happened, the drama is moving at a solid pace, not overwhelmingly (and unrealistically) fast but not dragging either. We’re getting questions answered, relationships developed and enough laughs and giggles to get through it. My only concern is that more of the cheesy, cliched plot devices will start to creep into the show with the entrance into the blossoming romance between Sung-joon and Hye-jin. Here’s to the hope that She Was Pretty will prove my cynicism wrong.